IPL 2019: Chennai is currently placed at the second spot behind table-toppers Kolkata. IPL 2019: Chennai Super Kings is one of the most close-knit franchise and enjoys a huge fan base. Many players of the CSK outfits are icons in India and are widely followed. The defending champions are known to have a lot of fun among the team. CSK lost their last encounter against Mumbai, but the yellow camp is still upbeat and the reason this time is Ravindra Jadeja, or should we say ‘Sir’ Ravindra Jadeja. Jadeja got himself a new beard color and it seems Dhoni and Raina found it humorous. “Say hello to Sir Jaddu’s One day BM (Brown Mane)! #WhistlePodu #Yellove,” CSK captioned the video on Twitter. Dwayne Bravo was seen in the role of a barber as he gave a new-look to Monu Singh. CSK is one of the favourites to clinch the crown, but it will not be easy as all the teams are well-matched. They are placed second in the points table after table-toppers Kolkata. The yellow brigade has played five matches and won three. 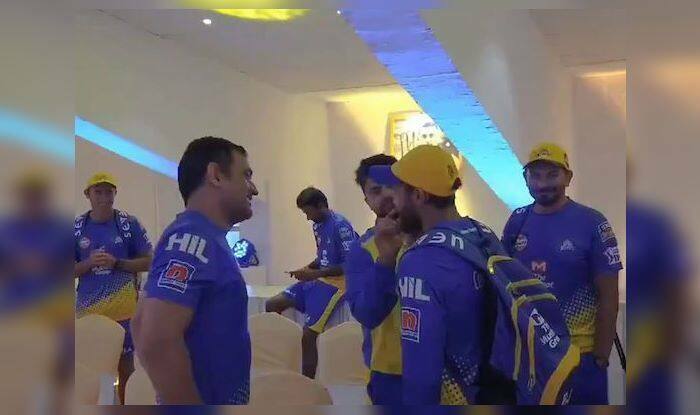 Dhoni is no stranger to playing a prank or two, he was seen getting involved in a race featuring Imran Tahir and Shane Watson’s kids after the Mumbai Indians clash at Wankhede Stadium.